Long-time VMC supporter Emily Lakdawalla at the Planetary Society has created an excellent animation from the image set acquired 8 August by Mars Express as it soared over the Red Planet's northern ice cap. Yesterday, I found a really nice set that I just had to animate, taken from a relatively low altitude over the picturesque swirls of Mars' north polar cap, which is brightly lit now by round-the-clock summer sun. This animation is composed of 23 photos taken by the 'Mars Webcam' aboard Mars Express, spanning a little more than half an hour on August 9, 2010. During the animation, Mars Express recedes from an altitude of about 4100 kilometers to about 7000 kilometers above the planet. The twisted canyons of Mars' north polar cap occupy the center of the view. Click here for a version at the camera's full resolution. We were delighted to see such a quick and well-done response to this image set - good work and thanks, Emily! Another long-time friend of the VMC, Mike Malaska, also posted a very nice comparison between two VMC images taken some six weeks apart, on 27 May and 8 August. "The north pole is at center in the two images, the 300 longitude line is approximately at top. Large differences in ice cover can be seen near Chasma Boreale (the deep chasm at lower center). The triangle shaped region at upper right is Olympia Mensae. Interestingly, while the August 8th image generally seems to have more ice overall, the region just poleward of Olympia Undae (which is the darker region poleward of Olympia Mensae) seems less ice covered than in the May 27th image." Well done, Mike - and thanks to you also! 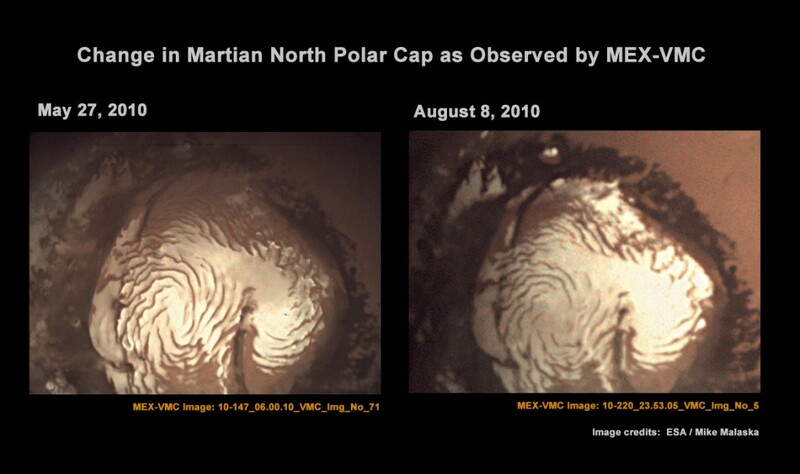 With two strong creations based on the excellent 8 August VMC image set, we thought it would be interesting to provide some background info on how the Mars Webcam acquired these frosty polar pictures. Hannes Griebel, Mars Express Spacecraft Operations Engineer and multiple past contributor to our VMC Blog, works on the mission planning system, and he provided this description. Mars Express primary scientific observations are always prioritised ahead of VMC operations. This usually leaves only small VMC picture-taking opportunities at the maximum distance from Mars (apocentre), since conditions at this point in the the spacecraft's orbit are often not usable for science operations (due to the large distance to the planet and firings from the Mars Express thrusters). Occasionally, an observation slot is available at a lower altitude, allowing VMC to operate much closer to the planet and take spectacular, and for such a simple device, quite detailed, images - such as the recent polar images from 8 August. When such a slot occurs, the Mars Express Flight Control Team at ESOC do all they can to make the most of the opportunity, while still maintaining the primary science operations required by the Mars Express mission. Images from any VMC observation, routine or special, are uploaded and made available via the VMC Blog immediately after they are received on the ground from Mars Express. However, their real potential is often revealed only after members of the public turn them into stunning compositions and animations - which we are delighted to receive and share via posting in the VMC Blog from here at ESOC! If you want to submit any work based on raw VMC image sets - be it processed images, animations, a poem, an artistic interpretation, an analysis of the image content or (more or less) anything else - then please feel free to contact us (you can find more details under Help us with VMC in the links to the right of this page). Thanks, Hannes, for this background report - and from all of us on the VMC team, thanks to everyone who has submitted results to the VMC Blog.